Home > Accountant CPA > The Burning Question: Will I be Audited? The Burning Question: Will I be Audited? Although anyone can be audited, taxpayers with returns that are a bit more involved or stray outside the “norm” have a higher chance of being distinguished. However, the IRS has a more specific guideline on who they pay more attention to and potentially tax audit. For starters, across the board, individual taxpayers are audited more often than businesses. On average, the chances of an audit are about 5%. For corporations the chances sit at a mere 4% yet roughly 6% for individual taxpayers. Traditionally, there are categories of taxpayers that the IRS knows to pay closer attention to, due to a historical trend of noncompliance. For instance, it’s more common for international taxpayers, high wealth taxpayers, and small businesses to have deliberate and accidental mistakes in preparing their returns. Whereas, regular wage earners with income reported on a W-2 face less criticism. The IRS has more intuitive ways than a tax audit to track the accuracy of a return. With new and improved matching programs, the IRS is able to match income from tax returns to the information they have on file, thus locating any discrepancies. Instead of individually auditing to locate noncompliance, the IRS can focus on a broad number of returns, relying on flagged information to widen their scope. The chances of being caught by the matching program coupled with the chances of an audit can come to 1 in 35 tax returns. You know that wonderful feeling when you receive news that you will be getting a refund this year? Imagine the contrast in emotion once the IRS sends you a notice that you actually owe hundreds or thousands in penalties as a result of a “closer look” at your return. More than 90% of individual audits result in a change in tax owed. These figures can and do reach in to the tens of thousands additional owed, especially from a more intrusive audit. Bottom line, tax audits are expensive. The truth is, if the IRS deems your return audit worthy, there is really nothing to do about it rather than prepare. However, there are many ways to avoid being flagged in the first place. 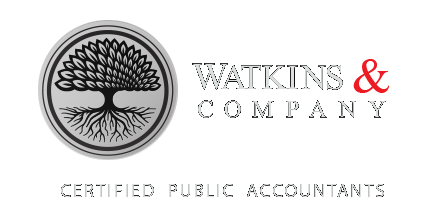 Hiring an accounting firm like Watkins & Company, to help with tax preparation will ensure that your taxes are prepared correctly. Even if an audit is inevitable, at least your taxes will have been prepared by professionals who know what they’re doing. Be sure to claim any income to avoid being flagged against what the IRS has on file. The more information your tax prep professional has, both current and past, the better. Still worried? You can ask your tax professionals to do a review of your return even after it is already filed. By obtaining current year IRS wage and income transcripts, tax accountants can ensure that all income was reported. If there are any discrepancies, then they can file an amended return to avoid any penalties related to a tax audit or notice.